Let's see how they compare to each other. 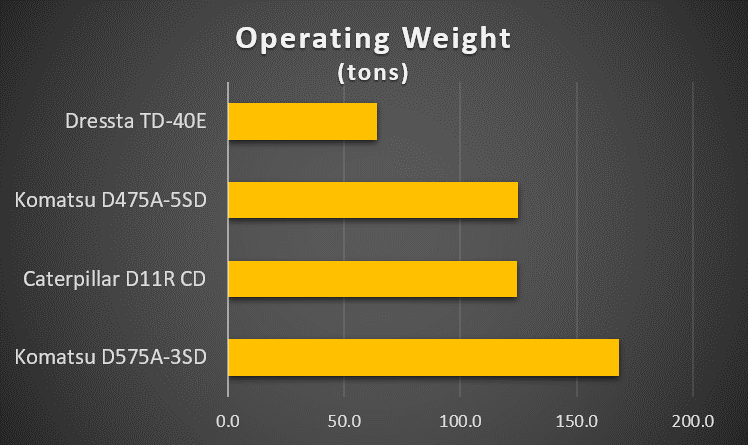 As you can see in the table below, the specs vary widely among the four bulldozers. As far as horsepower goes, the Komatsu D575A-3SD leads the pack with a net 1150 hp. The Dressta TD-40E brings up the rear with 520 hp. 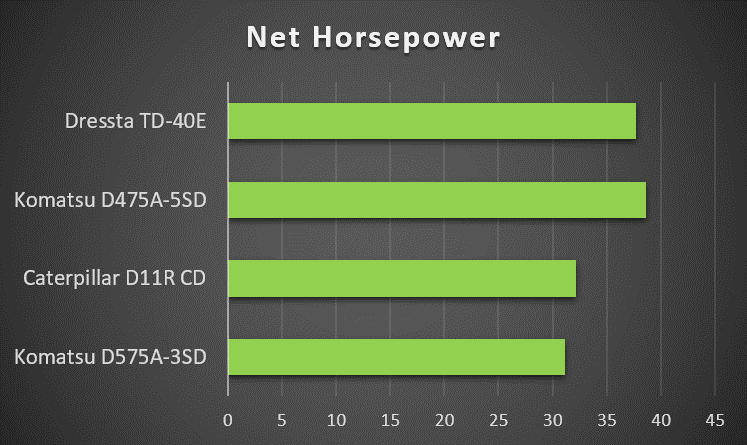 However, while the Dressta may have the least horsepower, it does have the highest rated RPM at 2100. The chart below provides a good visual representation of how the horsepower compares among these massive bulldozers. They are all extremely powerful! The operating weight of these monsters is incredible. The Dressta TD-40E is the lightest, which should come as no surprise -- but the lightest is a whopping 64.2 tons! The heaviest is going to be the Komatsu D575A-3SD at over 150 tons. Let's just say you wouldn't want someone to drop one of these on you! 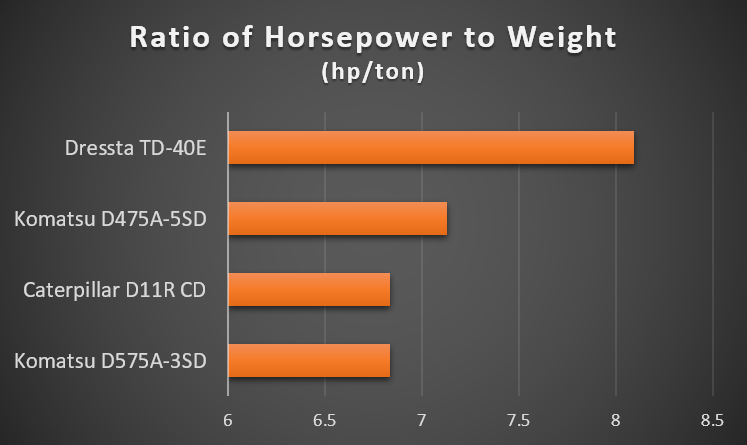 Now, here is something interesting to consider: the ratio of horsepower to weight. Even though the Dressta TD-40E weighs the least, it has a ratio of horsepower to weight of a little over 8, which is significantly more than the other monster dozers. It packs a tremendous punch for its weight and size. These behemoths are going to need a great deal of fuel to complete even a short job, so they are going to have large fuel tanks. 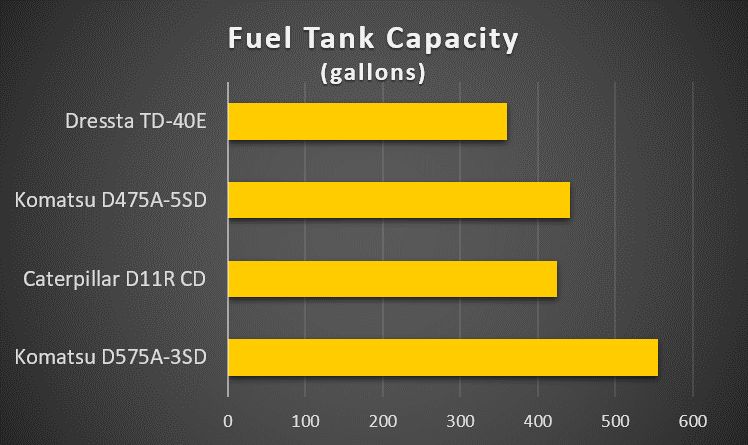 You can see in the chart below that the Komatsu D575A-3SD has the largest fuel tank capacity at about 550 gallons. Even the smaller Dressta TD-40 requires over 350 gallons for a full tank. Filling these machines up will definitely take a while. 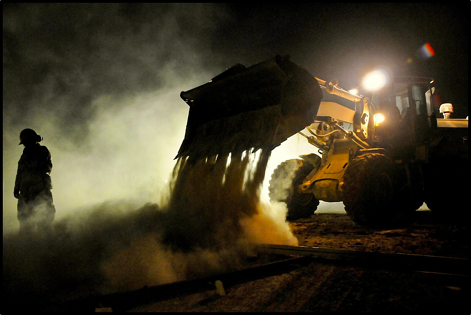 When it comes to the biggest dozers, the dimensions of the machine come into play. 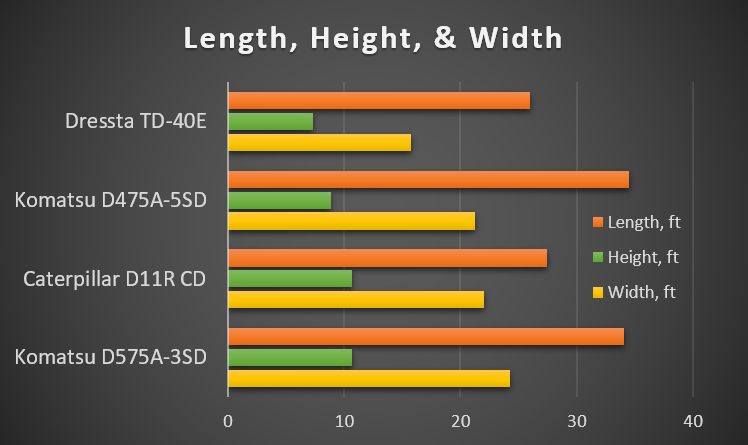 In the chart below, the Komatsu D475A-S5D has the greatest length, the Caterpillar D11R CD and the Komatsu D575A-3SD are running neck to neck in greatest height, and the Komatsu D575A-3SD is the widest. 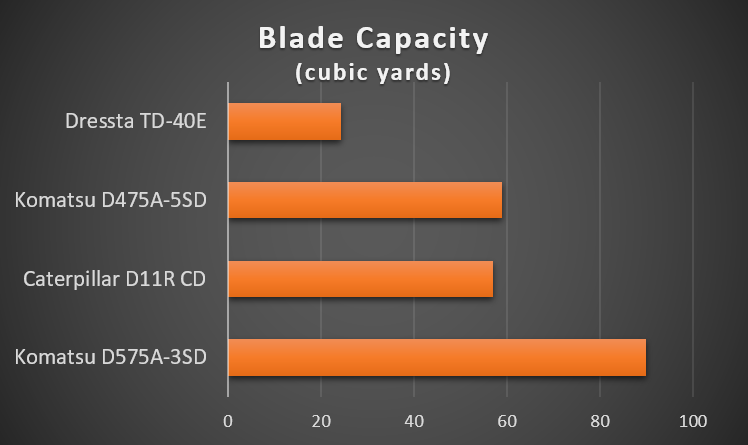 Here we see the blade capacity for these monster bulldozers. The Komatsu D575A-3SD wins for maximum blade capacity with about 90 cubic yards, but even the smaller Dressta TD-40E has an impressive 20+ cubic yard capacity. With these kinds of blade capacities, these machines can process material much faster than a standard bulldozer. Another dimension of interest for these large bulldozers is going to be the track shoe width, as well as the number of shoes per track. The massive Komatsu D575A-3SD has a track shoe width of almost 50 inches, followed by the Caterpillar D11R CD at a little over 40 inches. The Komatsu D575A-3SD also has the most shoes per track. It seems to lead the pack in almost every category. The Komatsu D575A-3SD has a triple-reduction final drive, while all the others have a double-reduction final drive. The two Komatsu models both have Torqflow transmissions, while the Dressta TD-40E and the Caterpillar D11R CD both have Powershift transmissions. The travel speeds for these dozers are summarized in the table that follows. These four bulldozers -- the Komatsu D575A-3SD, the Caterpillar D11R CD, the Komatsu D475A-5SD, and the Dressta TD-40E -- are the largest production dozers in the world. The are used for mining, land reclamation, stripping, and some major construction projects. Have any of you guys had the opportunity to operate one?